The graduation ceremony of Le Cordon Bleu Paris students took place on December 18, 2015. The ceremony was held at the ‘Cercle de l’Union Interalliée’ with graduate’s family members and friends. On this special day, Le Cordon Bleu was honored to welcome Chef Thierry Vaissière as class patron. Born in Béziers, the joyful atmosphere Thierry Vaissière experienced during family dinners, from a very early age, left a lasting impression on him. “For me, cuisine went hand in hand with making people happy”. It was, therefore, a natural step for him to decide that he wanted to work in the culinary industry and he went on to be awarded a CAP, BEP and cuisine Chef Bac Pro. The newly qualified Chef then headed to Paris to perfect his skills and began working in the kitchens of the Lucas Carton with three-starred Chef Alain Senderens who was, at that time, considered to be one of the best Chefs in the world. During his time there, Thierry Vaissière became passionate about beautiful seasonal products, precise technical skills and subtly combining flavors. He then joined the kitchens of Drouant and of the prestigious Tour d’Argent, both also Michelin-starred restaurants. Later on, having acquired extensive experience, he spread his wings with the inauguration in the United States of the Paris Las Vegas Hotel. His passion for Mediterranean cuisine then led him to the Pourcel brothers (three Michelin-starred at Le Jardin des Sens) to take over the Maison Blanche restaurant in Paris. Following 10 years in the industry, and having been elected “World’s Best Business Restaurant” by the American magazine Forbes, he decided he needed a new challenge and took over the kitchens of the Sofitel Paris le Faubourg. The Chef is renowned for his Mediterranean inspired cuisine, which pushes the culinary boundaries while respecting tradition. Everything provides food for thought, and his life is full of encounters that give him true creative freedom. Today, Thierry Vaissière is in charge of the kitchens at one of the best kept secrets in Paris, the beautiful Maison de L’Amérique Latine, located in a green and elegant haven in the Saint Germain district. Having taken part in the creation of the Maison Blanche restaurant in Fez in 2008, Thierry Vaissière remains the restaurant’s Chef. Now, after your time at Le Cordon Bleu Paris, you are the new ambassadors of the French Art de Vivre, you who have been immersed in our traditions, in our philosophy of life, with our extraordinary products from terroir that is diverse and unique in the world. You have to get to the bottom of things, go deep in yourself to carry your business, so that it can progress and grow. This December 2015 class was composed of 45 students, coming from 35 countries. 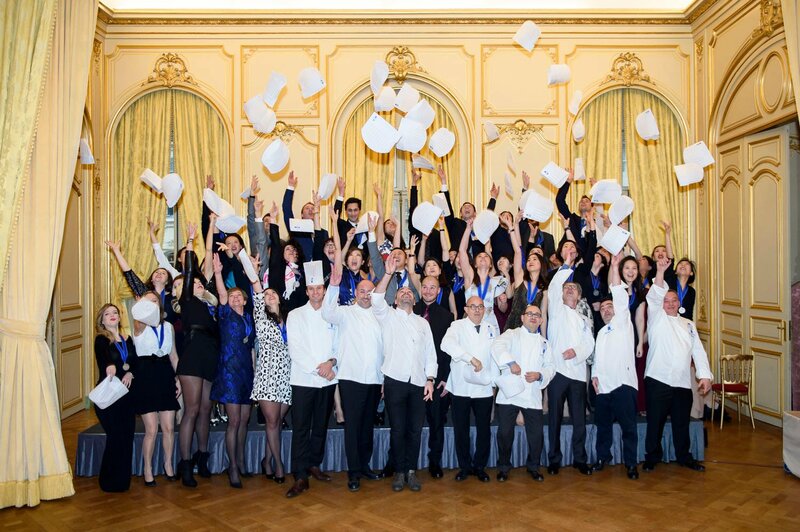 Le Cordon Bleu Paris congratulates all students! Our best wishes to the graduates. Best of luck to those who are pursuing internships or other professional projects.